Blame it on my English ancestry, but there's just something I find so appealing about this monarch's profile! 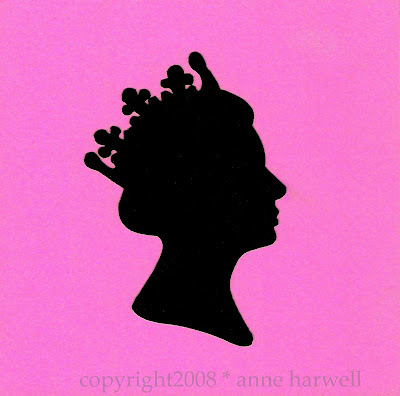 This handcut silhouette collage features the British regent in all her regal splendor on a luscious lilac colored background. This is a limited edition, completely hand-cut and assembled collage - 6x6 on gessoboard. Numbered and signed by artist on back. In "Etsy", "Lilac", "Queen Elizabeth 2", "Silhouettes"